Are you looking for continuing education credits for the ACE certification? You have come to the right spot! I will give you all the best options available. 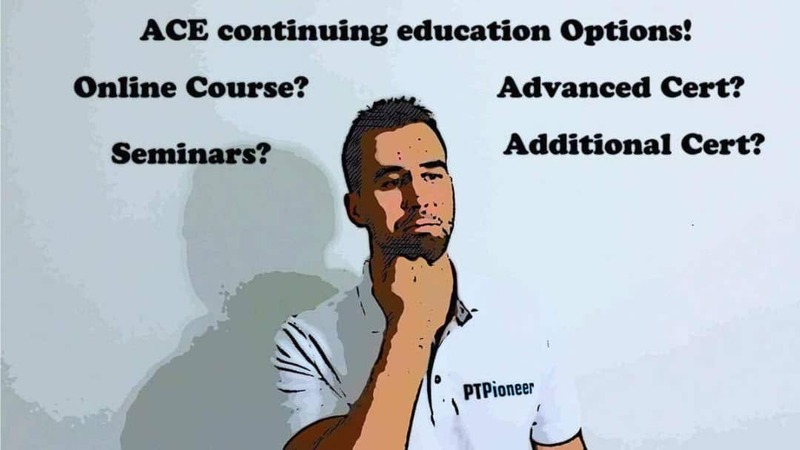 Some other super helpful articles that will help with continuing education are advanced ACE certifications, advanced NASM certifications as well as the top fitness nutrition certifications. All of the Certs mentioned in those above articles are fantastic continuing education options as well. This article is quite similar to my report on NASM continuing education credits. Every two years ACE requires you to get continuing education credit (CEC’s) to get recertified through them. In my article, I will be discussing all of the various ways that you can receive these continuing education credits. Honestly, there are so many different ways to receive continuing education credits I will not discuss every single way. There are hundreds of life workshops, online courses or additional certifications that you can obtain to fulfill your required CEC’s. The only thing that matters is if ACE recognizes the provider of those credits as being reputable. You are required to complete 2.0 CEC’s and be able to show proof of this to get recertified. This adds up to approximately 20 hours of additional education in the health and fitness field. The primary ways of getting recertified I will be talking about in this article are: receiving an advanced certification, attending a local seminar or taking an online course. And since you need to do this every two years to get recertified, it is always a good idea to have multiple options. Let’s jump right into my ACE continuing education options article! Out of all of the options that I will talk about in this article, this is the method I recommend the most. It is not the cheapest option, but it will improve your knowledge and make you a better personal trainer! By specializing in one form of training or another, you become a much more diverse personal trainer, will be able to market yourself to new clients and will be able to make more money. All of the best personal trainers that I have ever known hold multiple personal training certifications as well as advanced certifications. When talking to these individuals, none of them regret receiving multiple certifications because they value the knowledge that they gained from them. Because you are reading this article, I am guessing that you are already certified through ACE. You might want to consider getting certified through another organization such as NASM, ACSM or NSCA! Check out my article on the best personal trainer certifications! Or check out my versus section that contains articles like ACE vs NASM, NSCA vs ISSA or NASM vs ISSA! One of the best general certifications to complement your ACE certification is the NASM certification, check it out here! Besides Studying for and receiving an additional “general” certification for your continuing education credits, another option is to get an advanced or specialized certification. NASM’s corrective exercise specialist certification (link to site), ACE’s orthopedic exercise specialist (link to website), ACE’s health coach certification (link to site) or a group exercise certification. 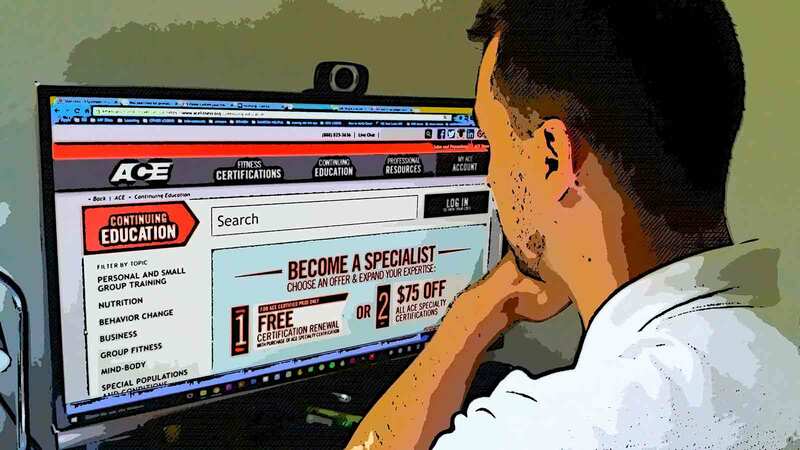 If you want to check out all of the specialized certifications that I talk about my website had over to the advanced certification section. If you have a lot of clients that would benefit from any one of these advanced certifications, I would highly recommend getting one! One of my favorite specialized certifications is the ACE group fitness instructor certification (link to site). Switching it up from one-on-one personal training to working with groups can be hugely entertaining and also increase how much money you make. If you’re interested in becoming a health coach, check out my article on how to become one! Taking online courses as a way to complete your continuing education credits is one of the cheapest and quickest ways that you can do so. There are hundreds and hundreds of online courses that you can take. Big organizations such as ACE and NASM offer courses as well as advanced certifications. You can find these courses on their websites. Some examples include the ACE group exercise course and special populations course. The group exercise course is different than their group exercise certification. Most of these courses will cost between $100 and $200. In comparison, most advanced certifications will cost approximately $400 or $500. If you want to save some money, I suggest heading over to a website by the name of exerciseetc.com. They have a huge list of courses and also show you how many continuing education credits/units each course worth for each of the major certifying agencies. There are plenty of courses that cost approximately $70 that will fulfill 1.9 CEC’s for ACE. The additional .1 will always be getting recertified with a new CPR/AED card. This is true for all certifications. The third and final option that I will be talking about is attending a regional workshop on health and fitness to fulfill your continuing education credits for ACE. Most of the major cities in the United States frequently hold seminars related to fitness. I wish I could have one site for you to check out to see when and where the seminars take place. The best advice I have for you is to Google “exercise/fitness seminars near your location.” You might be out of luck if you don’t live close to a larger city. In this case, one of the other two options that I mentioned above might be a better choice for you. The cool thing about local seminar this is that you get hands-on experience most of the time. And since a lot of us are visual or kinesthetic learners, this can be very beneficial for continuing education! These are the three primary ways you can get ace continuing education credits. As I mentioned above, I think that the best way to go about your continuing education is to either get an advanced or specialized certification or an additional general certification from a separate certifying agency. I highly recommend checking out the NASM certification as an additional general certification! If you are on a budget, I would check out some of the courses offered by ACE or NASM or check out the courses on exerciseetc.com. If you are a kinesthetic learner or want some hands-on experience, you might have good luck attending a seminar. Please share this using one of the social media buttons if it was helpful for you or tell people about it! Since you need to receive continuing education credits every couple of years, try to remember the different Until next time, happy personal training!